Did you know that Halloween is the second highest grossing commercial holiday after Christmas? Or that Ireland is considered as the birthplace of Halloween? There are so many interesting facts about this holiday that occurs each year on October 31st and it means having so many ghosts, skulls, spiders and so many other scary decoration around the house and inside it. There is plenty of choice when it comes to decorations and you don’t always have to spend money on store – bought items. In fact, Halloween is the perfect time to let out your creativity because there is so much that you can do yourself. We picked ten decorations for this and we hope you’re going to like it. Creating 3D art is really easy, even if you might think it isn’t! Before you start, make sure you have 12-inch orange honeycomb ball, green paper, brown floral wire, white foam board, 20-inch square black frame, scissors and hot-glue gun. 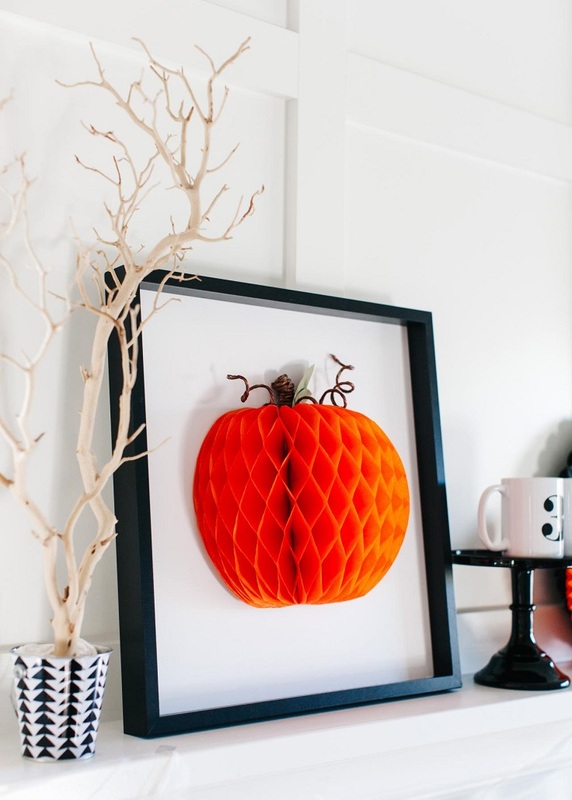 Start with the honeycomb ball, then create the leaves and assemble the pieces into a wall art. The best way for having a well-painted pumpkin has few steps and the first one is also the most important – clean it good with water solution and mild soap, let it dry and spray it with flat/matte paint so that you’ll get a good base. Use spray paint for painting the pumpkin and paint pen for writing stuff on it. Find a great spot in the house for it and you’re all ready. It’s amazing how many interesting projects can turn out just from a regular mason jar. In this project, it’s all about creating a spooky atmosphere inside it. You need mason jars in pint- and quart-sizes, styrofoam disks and balls, moss, sharpie, twigs from yard. gauze from First Aid Kit, scissors and glue gun. 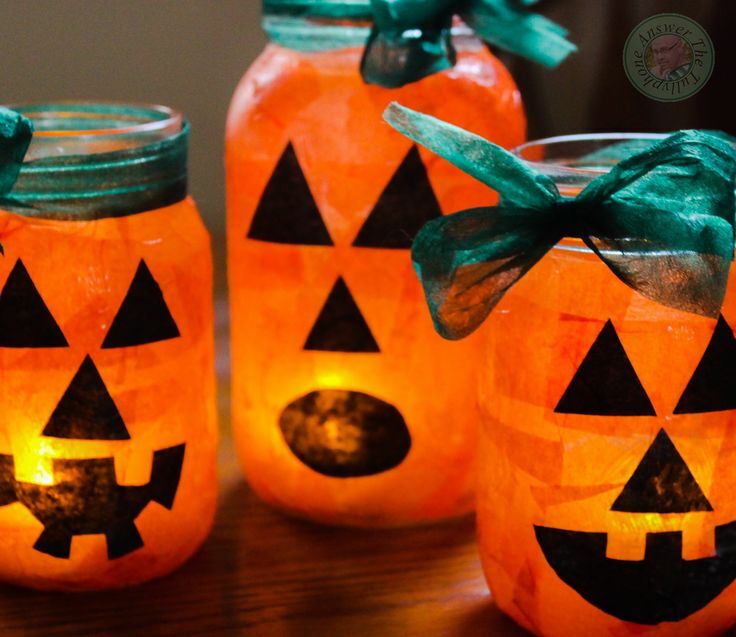 Add few pumpkins around the jars are you created the perfect Halloween atmosphere. 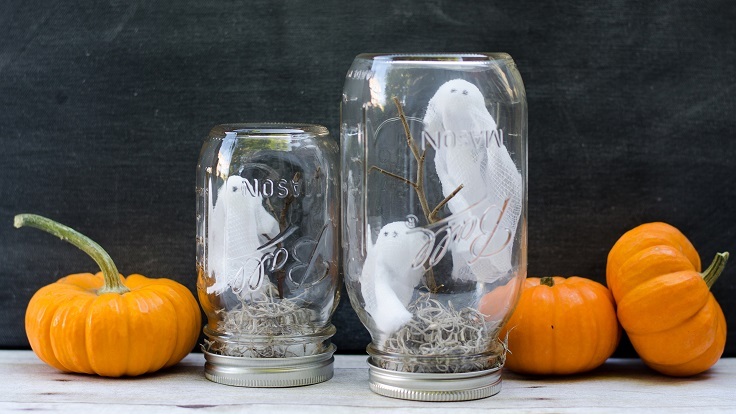 In this project we have the mason jars again, but this time as Jack – O lantern. You need orange and black tissue, scissors, foam brush, mod podge and ribbons. If this look doesn’t gets your approval, not that the Jack-O lanterns aren’t messy, give off bad smell and don’t require sharp objects besides the scissors, which makes them perfect for some family time! 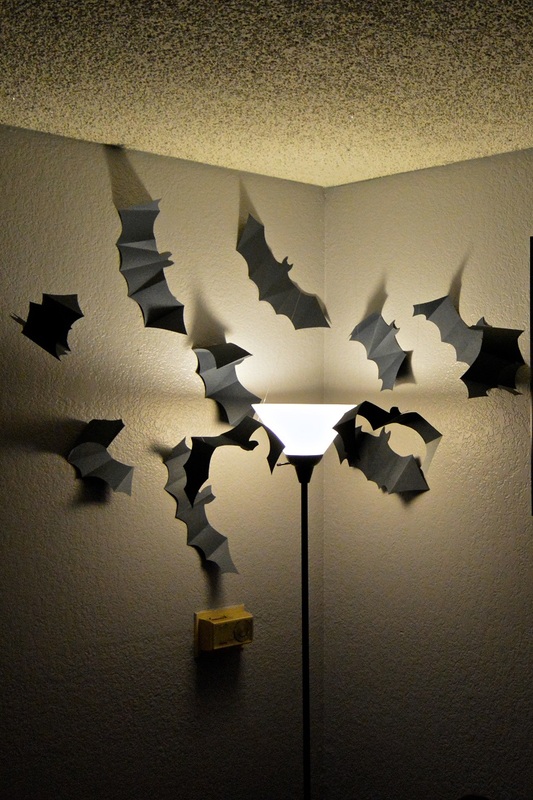 One of the things that remind us instantly of Halloween are the DIY bats. They are very easy project and totally fit with the whole spooky atmosphere. They are little details, but add so much to the interior. Here’s what you need for the paper bats – several large pieces of black construction paper, scissors, pencil, clear fishing line and lear thumb tacks. Spiders really know how to create a spooky atmosphere – the bigger, the more legs, the creepier it gets! The good thing about these spiders is that they aren’t real. 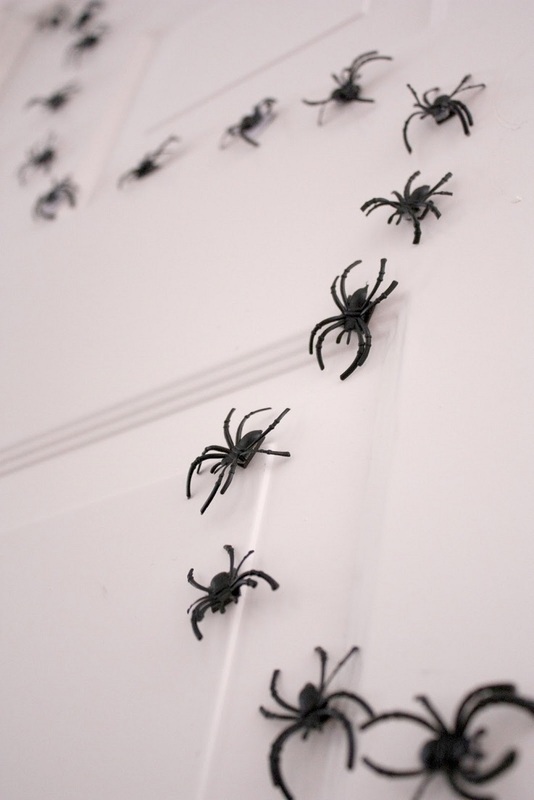 You can easily make them if you need more Halloween decor in the house and for that you need: plastic spider rings, scissors, hot glue and magnets. It’s super easy and super creative! Now, this project here is a really creepy one! Looking at this photos gives us the creeps. 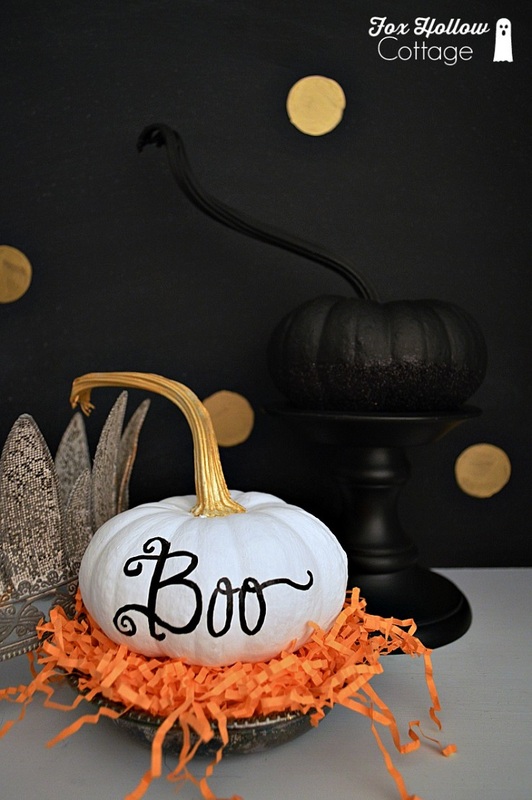 But, it’s surely a nice way to scare somebody and add the Halloween charm into your home interior. This project is really easy and also budget – friendly. 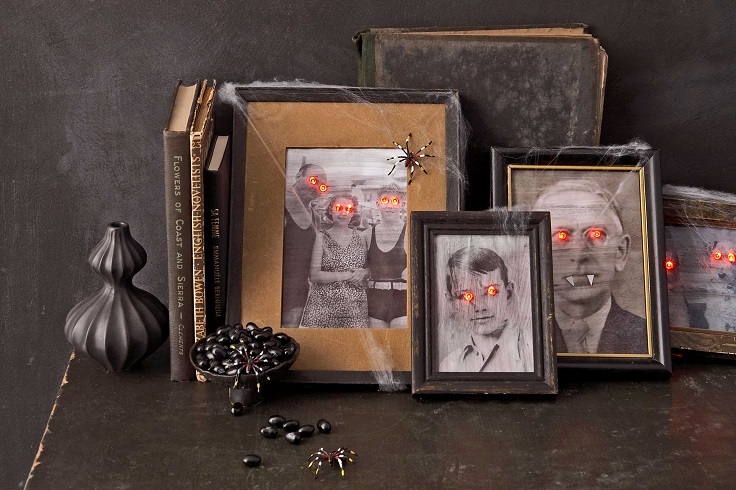 You will need to print out black and white photos, LED Christmas lights for the eyes, old photo frames and sponge. The beautiful, but yet a little creepy poem can actually inspire your home interior for this year’s Halloween. 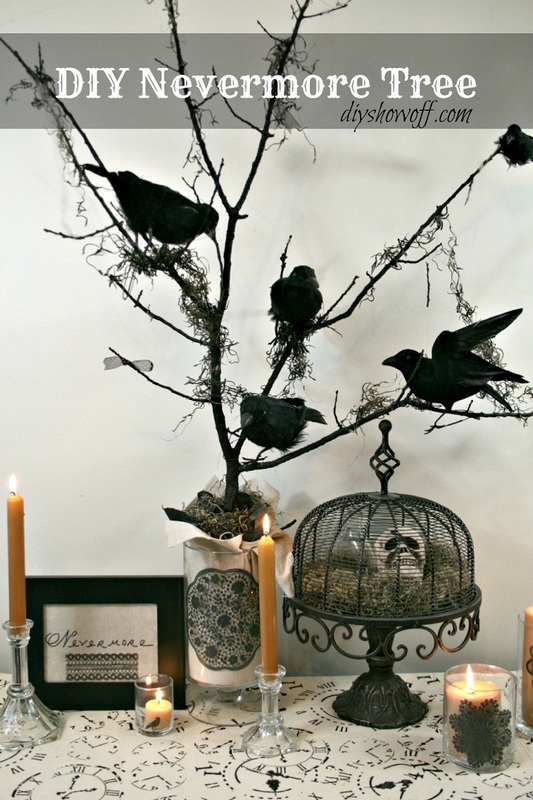 You need a vase (or any other container where you can place small branches), small branch, black spray paint, styrofoam cone, handful of dry moss or shredded newspaper, crinkled paper, some accessories such as faux crows, plastic spiders, cotton spider webbing, ribbon and low temp hot glue. 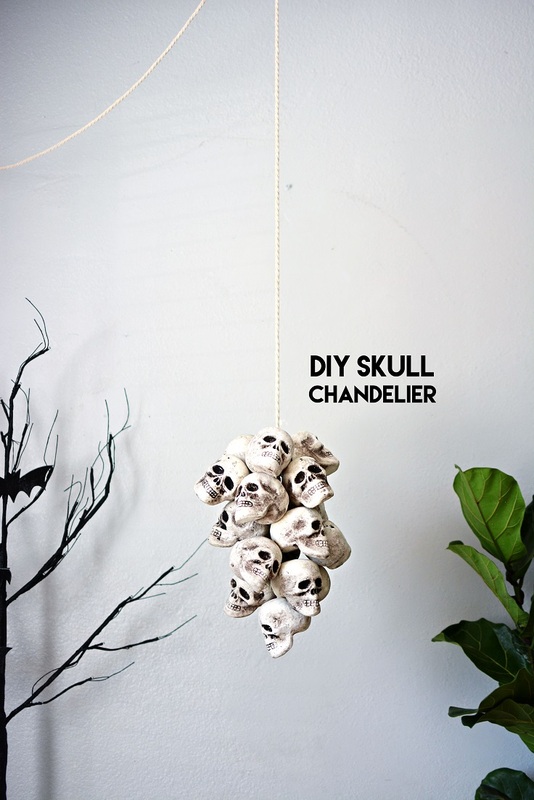 One of the easiest projects on the list, for the skull chandelier you just need two materials – foam skulls and cord. Attach one skull at the bottom using cord, and continue adding skulls on the top of each layer and when you’re done, just hang it to the ceiling and you’re done. It’s time for some bloody effects! 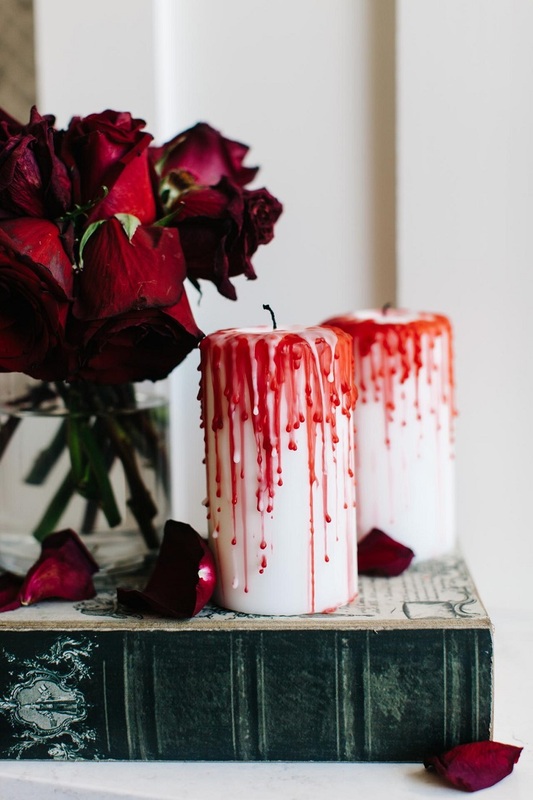 To achieve the bloody candle, you will need to work with one red and one white candle. It’s all about allowing the red wax from the lit candle to drip on to the white pillar candle. When you’re done, place them on the candle holder and you’re ready.